The feature directorial debut of star Clint Eastwood, the "obsessed lover" thriller Play Misty for Me is essentially Fatal Attraction sixteen years before Fatal Attraction existed. Seeking to do something different from the man-of-action roles he had become known for, Eastwood cast himself as a Carmel-by-the-Sea radio DJ Dave Garver, who is gaining some attention, female attention in particular, for the soothing hosting style he brings to his five hour block of nighttime mellow grooves. Among those falling for his voice is Jessica Walter as Evelyn Draper, a woman who regularly calls in with requests that he play the song "Misty". Dave's after-work stop is the Sardine Factory Restaurant, where Eastwood gives his frequent collaborator filmmaker Don Siegel (who was on set as Eastwood's mentor while the actor made his transition into directing) a cameo as a bartender named Murphy. One night, Dave spots a lonely woman sitting in the bar. Evelyn Draper. Dave thinks he picks up Evelyn with his charms, but the truth is she went there specifically to be picked up by him, since he had talked about the Sardine Factory on air. Dave quickly finds out that Evelyn is the "'Misty' chick", but he sleeps with her despite knowing he has been duped by a groupie. Dave probably figures it was a one night stand. But then Evelyn shows up unannounced at his home the next day... and spends a second night with him. Through all of this, Dave is a very generic, soft-spoken good guy. He's always as calm and gentle as he can be with Evelyn, rarely getting worked up about anything that's going on. Even when he's mad, he keeps control. There's really nothing all that interesting about the character at all - in playing against type, Eastwood went from badass to bland. As Evelyn's sanity continues to crumble, things get even worse. Attempted murder is replaced by murder. She kidnaps Tobie. She attacks Dave with a knife. More than once. The actor who really shines in this film is Walter, who does an incredible job playing both sides of Evelyn - sides which the character can go back and forth between like flicking a switch. Dave could have been played by anybody. Evelyn is the important role, and Eastwood found the perfect actress to bring her to life. Walter even earned a Golden Globe nomination for her performance. His first time behind the camera, Eastwood pulled off the same feat he has become known for - he brought the movie in ahead of schedle and under budget. Part of the reason why Eastwood was able to do this is probably the fact that he is a very straightforward shooter. Some nice lighting aside, there is nothing remarkable about the way he shot Play Misty for Me, no fancy camera tricks. The most impressive thing about the look of the movie is actually the beautiful Carmel-by-the-Sea locations Eastwood shot in. This movie is basically the town's future mayor putting together a promo for the place. There just happens to be a psychological thriller playing out amidst this dazzling scenery. But Play Misty for Me didn't need attention-drawing camera work or overly stylish visuals. It's exactly what it needed to be. Nothing more, nothing less. 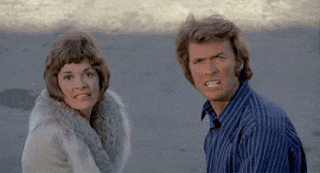 Eastwood brought the script by Jo Heims and Dean Riesner in a serviceable way, the film provides a decent amount of entertainment, keeps your attention, and serves a showcase of both Carmel-by-the-Sea and some excellent acting by Jessica Walter. It still holds up to this day as a sterling example of a sub-genre that has many entries, including Fatal Attraction, with more and more showing up all the time. Nearly fifty years later, Play Misty for Me is still worth giving a spin. Mitch Brockden (Dominic Cooper) is a man who has it all - a lovely wife, a newborn baby daughter, and a career as a hot-shot prosecutor who never loses a case. Unfortunately, he also has a crew of buddies who aim to give him something else, a tequila hangover, during a night out on the town. Despite being buzzed, Mitch attempts to drive himself home and accidentally runs over a pedestrian. Afraid of losing all he has put together for himself, he pulls a hit and run. 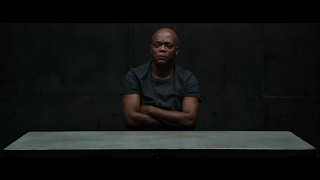 In an odd turn of events, the body of his victim is found in the back of a van belonging to Samuel L. Jackson as Clinton Davis, a man who says he was just trying to get the guy to the hospital. There is no sign of a hit and run, only the victim's blood all over Clinton, the inside of his van, and the tools he had in the back. Well, Clinton has made himself a perfect scapegoat, so a conflicted and scared Mitch prosecutes him for the crime he committed, working on sending a random guy to prison while fearing that his own guilt is going to be discovered at any moment. But since the film is told from Mitch's perspective and we can't have a protagonist who gets away with doing something so heinous as blaming his serious crime on another person, the situation gets a lot more complicated. Directed by Peter Howitt (under the name Peter P. Croudins) from a screenplay by Peter A. Dowling, Reasonable Doubt is a low profile thriller I might never have gotten around to watching if my Remake Comparison collaborator Priscilla didn't randomly put the movie on while I was visiting her one time. It just would have slipped past my radar. While this isn't the sort of movie I would have actively sought out, once it was playing in front of me I was quite interested in what was going on. Dowling and Howitt/Croudins crafted an intriguing story here, and a solid pair of actors were cast in the lead roles. This got the appropriate release, audiences weren't going to flock to see this on the big screen (and judging by the 31% positive audience score it has received online, I guess they wouldn't have been too pleased if they had caught it in a theatre), but it tells a decent story and is a perfectly fine time waster if you happen to stumble across it some evening. It won't blow you away, but I'd rank it higher than 31%. While young Timmy (Cole Mathewson) was out trick-or-treating, someone slipped a VHS tape into his treat bag, a fact the boy doesn't realize until he returns home with his sister Tia (Sydney Freihofer) and babysitter Sarah (Katie Maguire). The kids are intrigued by the tape, they want to see what's on it. Being a responsible babysitter, Sarah sends the kids out of the room so she can check the tape and make sure there's nothing inappropriate on it. It's somewhat surprising that the family still has a VCR set up and at the ready, but I'll go along with it. After seeing imagery of creepy locations, creatures, and a maniacal clown, Sarah decides the tape is safe, it's just a horror movie, and calls the kids back in so they can watch it together. What plays out on the screen is actually an anthology film, consisting of short segments crafted by writer/director Damien Leone. There are three segments to All Hallows' Eve, plus the wrap-around with Sarah and the kids, and two of the three were shorts Leone had made earlier and released separately. First up is a segment called The 9th Circle, which is set on Halloween and begins with a young woman sitting by herself in a train station. When an evil fellow known as Art the Clown (Mike Giannelli) shows up in the station, things get really bad for the girl. She goes unconscious and is abducted, waking up chained in a basement somewhere with a couple other girls, forced to wait to be killed by a cult of monstrous creatures. It's decent enough, with the best thing about it being Art the Clown and the looks of the cult members. The 9th Circle was made in 2008, but it's not quite an untouched version of the short that has just been dropped into this feature. Leone has chopped it up a bit in the editing, cutting away to the reactions of Sarah, Timmy, and Tia during the bloody action. 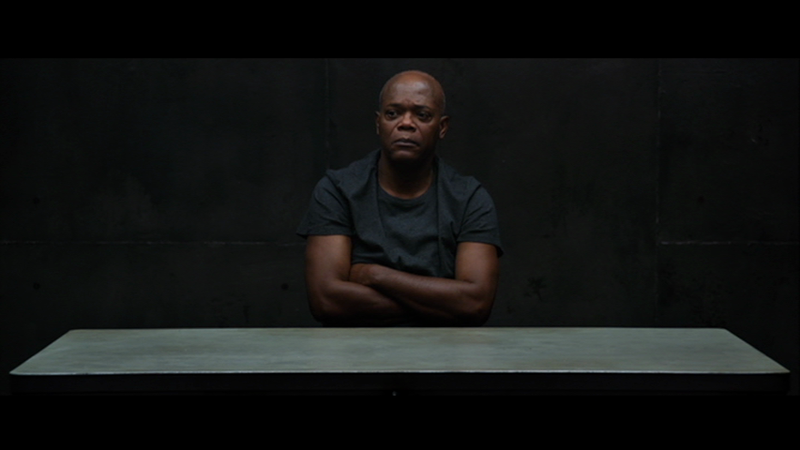 These actors can provide believable reactions, but seeing them somewhat lessens the impact of the short. Timmy and Tia are sent to bed for a night of restless sleep after that one, but after spending some time watching the immortal (and public domain) classic Night of the Living Dead, Sarah decides to continue watching the VHS tape by herself. The second segment is an all-new short made for this feature and again centers on a young woman by herself - this time it's a woman who has just moved into a new place with her artist husband, who lately has been painting things he doesn't remember painting. He just wakes up and there the art is. The husband isn't really part of this short, though. It's just the wife being tormented by strange activity of an alien nature. The short is effectively creepy, tapping into a childhood fear of mine - I was concerned that creatures from outer space might someday land in the field behind my house. That's basically what happens here, and it's not a pleasant first contact. The husband's mystery painting was of Art the Clown, who returns in the final horror story on the tape, which is Leone's 2011 short Terrifier. In this one, a young woman (what did you expect?) is on a road trip by herself (of course) when she witnesses Art committing a murder at a remote gas station. Art notices his audience and gives chase. All of All Hallows' Eve has a touch of old school charm to it, thanks to an '80s-style synth score. Terrifier takes that throwback aesthetic a step further, with the image being digitally manipulated, complete with fake film grain, to make it look like it was shot a couple decades earlier (never mind the presence of the more modern car). This stylistic choice, combined with the fact that the segment is just a simple stalk and slash chase sequence - and one that's at times reminiscent of a Creepshow 2 segment - made Terrifer my favorite part of the whole film. Even if the ending goes too far. Weird things have started to happen while Sarah continues watching the VHS tape, it seems like someone has been lurking around, and the babysitter has to deal with some reality-bending horror herself before the end credits roll. Overall, I found All Hallows' Eve to be an entertaining way to pass 83 minutes. I loved the old school elements, and the set-up with a babysitter on Halloween made for the perfect wrap-around. This movie had passed me by for almost four years (and the shorts it's made up of had passed me by for even longer than that), and I'm glad I finally caught up with it. If you like anthologies and horror movies of the '80s, seek out All Hallows' Eve and give it a try. Saturday Night Live first hit the airwaves in 1975, and when director John Landis was assembling his 1978 film Animal House the producers suggested that he cast several other SNL stars around John Belushi. If they had gotten their way, the film's cast would have included some very well-known comedy stars: Bill Murray, Chevy Chase, Dan Aykroyd. Landis opted to cast unknowns and dramatic actors instead, as he didn't want to make a Saturday Night Live movie... Which is ironic, because his next film literally was a Saturday Night Live movie. 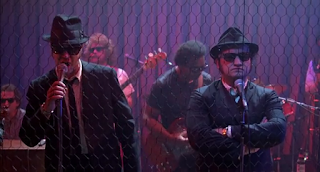 The Blues Brothers is based on a pair of characters Belushi and Aykroyd first played in a musical sketch on a 1978 episode of SNL. After choosing not to cast Aykroyd in Animal House, Landis ended up writing the script for The Blues Brothers with him - although the collaboration primarily consisted of Landis paring down the massive, two-part-movie script Aykroyd had written into something suitable for a single feature. Landis was also thinking epic, though. The idea was that The Blues Brothers would be a three hour roadshow presentation, with an intermission in the middle. That didn't happen, and the final version of the film ended up being 133 minutes (148 if you watch the extended cut) instead of three hours. Generally, I think comedies should aim at being as close to 90 minutes as possible. Judging by the running time of several movies Judd Apatow has been involved with, he clearly doesn't agree, but I don't think comedy should run long. It gets tiring. A comedy movie should hit the ground running, deliver some laughs, and get out as quickly as possible. The Blues Brothers is one of the rare exceptions (although I do think it could have been cut down some from 133), as the laughs and gags here have to share the running time with musical sequences and extended vehicular chases. Belushi and Aykroyd star as Jake and Elwood Blues, brothers who fronted a band that has fallen apart while Jake served three years in Joliet prison. After Elwood picks Jake up from jail, their first destination is a visit with Sister Mary Stigmata (Kathleen Freeman), a.k.a. The Penguin, the nun who raised them in an orphanage. During the visit, they find out that the orphanage is going to shut down if $5000 in property taxes aren't paid. While observing a church service led by James Brown as Reverend Cleophus James, Jake is struck by a divine realization: if he and Elwood can get their band back together, they can raise $5000 playing gigs and save the orphanage. Putting the band together and playing some gigs sounds simple, but it doesn't go easy for the Blues brothers, who are impeded along the way by the police (who want to arrest Elwood for a staggering amount of traffic violations - John Candy leads the charge), a group of Nazis (after the brothers disrupt a rally), a band they steal a gig from, and Carrie Fisher as Jake's homicidally angry and heavily armed ex. 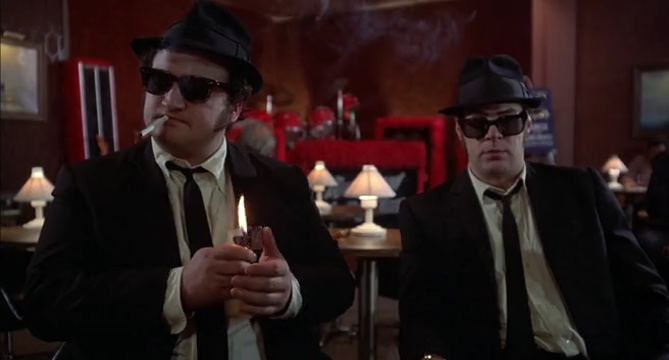 The humor in The Blues Brothers works well, the musical sequences are cool, and these elements are combined in the scene I find to be the most memorable. It's when the band steals that gig, which happens to be at a country bar where the clientele are so rowdy that the band has to perform behind chicken wire to protect them from thrown objects. The crowd doesn't react well to their regular set list, so the band has to improvise and perform the theme song from the TV show Rawhide. When they're packing up to leave the bar, they're informed that they actually owe money to the owner - the gig paid $200, and they drank $300 worth of beer. Even more than the comedy and the music, I'm drawn to The Blues Brothers because of the destructive vehicular chase sequences. 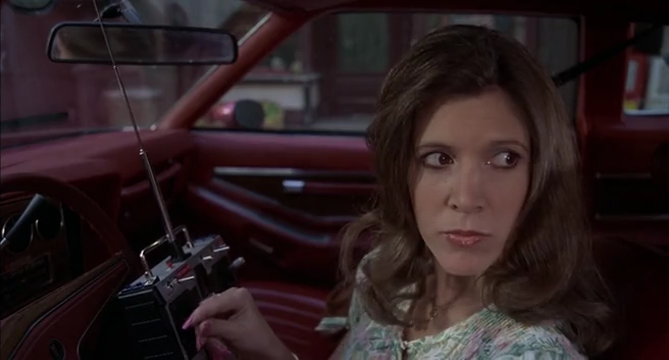 There's an awesome one early on where the brothers try to evade police by taking their Bluesmobile (which used to be a police car itself) through a shopping mall. They bust the hell out of the place, driving through the halls and smashing through stores, and what makes this sequence all the more impressive is the fact that it was shot inside a real mall in the Chicago area. The film then builds up to a climactic chase that is a stunning thing to behold. The Blues Brothers is a movie I watched a lot of cable when I was a young kid, and then it lapsed out of my viewing rotation. I've only seen it a couple times in the last twenty years or so, but I always have fun watching it when I get back around to it again.